Many cultures add milk to their tea. British style tea, Taiwanese milk tea, masala chai and teh tarik are just a few that come to mind. Perhaps as you're reading this you are enjoying a milky tea latte. But when did milk get introduced into tea, and why? Adding milk to tea is not just for altering the flavor. You may think that Western Europeans (most notably Britain) would be the first to add milk to their tea since it's such an important tradition today. People fight about adding the milk first, or tea first, and there are strong arguments for both. Perhaps you've heard a bit more about the subject, and you are either a 'miffy' or a 'tiffy'. But when did this all really start? Like the Tibetans, they subsisted on a heavy diet of meat, milk products, and grain, and prized tea for its digestive properties. An ordinary cup of Mongol tea was prepared by breaking a tea brick into pieces with an axe, crushing the tea in a mortar, and boling the crumbs with water and a pinch of soda to extract all the strength and flavor. This infusion was set aside, and cow's or goat's milk oiled with an ample amount of salt. The tea infusion was then mixed with the milk, and some flour and Mongolain-style butter, made by boiling cream at a low heat, added. When this yellow broth had been brought to a boil, it was transferred to a Mongolian teapot- a two-foot cylindrical brass container with a handle on the side and two holes in the soldered lid: one for tea and one for air, and served in simple wooden bowls. In the case of Tibetan tea, yak milk and butter is added to increase the nutrition and caloric content of the tea. This tea will warm you up, give you energy, and keep you hydrated at the intense altitude of a cold, nomadic lifestyle. In areas of Mongolia, yak, horse, or sheep's milk would be added. I've only had Tibetan tea in restaurants, and I'm guessing it's not exactly like the stuff you'd get at the source. But the tea I've had is heavy, salty, and...barnyard-y. It'll definitely fill you up and keep you warm. I found this interesting article from Eater that mentions a type of yak milk tea from Tibet. It'll give you a good idea of what the brew is like, and gives interesting cultural insight into the tea. When the Dutch and British started adding milk to their tea, it could be because it was mimicked by what they saw in China. But others argue that it was to temper the delicate porcelain cups they created. 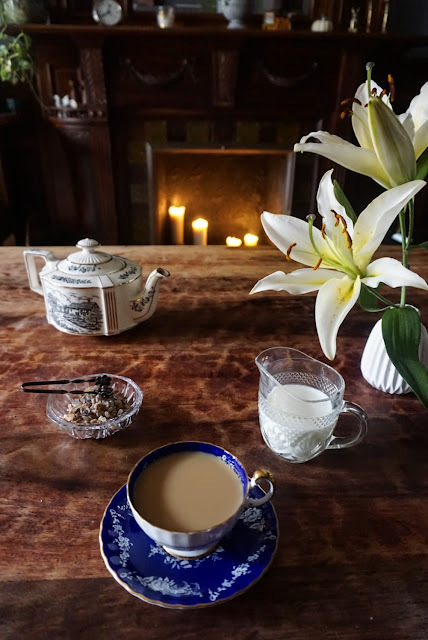 Chinese porcelain cups were small and the tea was made to be consumed quickly. But when Europeans started manufacturing their own porcelain, they made the cups larger, which of course held more tea. This larger amount of tea sat in the cups longer, and would cause the delicate porcelain crack. But adding the milk first would lower the temperature, saving the precious pieces. Adding milk was reportedly popularized by Madame de la Sablière, an important figure in French society who in 1680 served tea with milk at her famous Paris salon. She supposedly added the milk because she wanted to save her delicate porcelain cups from cracking. This certainly makes sense, but there are other reasons why milk was added. The quality of tea in the 17th and 18th century wasn't very good, due to poor storage and long ship voyages. Adding milk would dilute the pungent favors created from the poor quality tea. Another reason came a little later, as working class British citizens sought something to revive them in the middle of the day, and a brew of tea and sugar would do just that. I've often read books where coal miners and other laborers took flasks of milky sweet tea with them to revive them throughout the day. This idea is related to 'high' tea and 'low' tea, but that's for another blog post! Of course, milk tea is popular all around the world today, and as I type this I'm craving a strong masala chai latte. 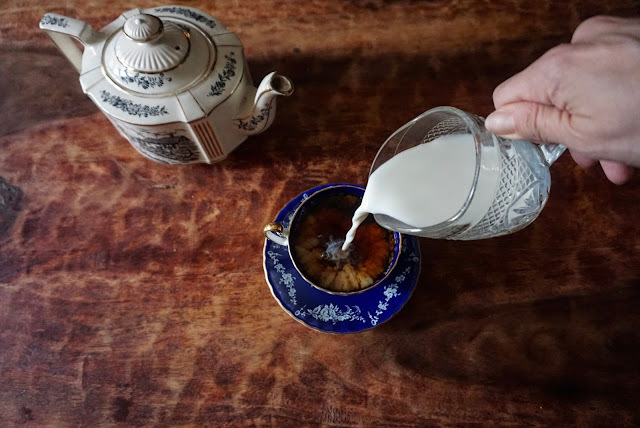 For one of the unique ways of adding milk to tea, check out my post about East Frisian tea. Have you tried Tibetan butter tea? 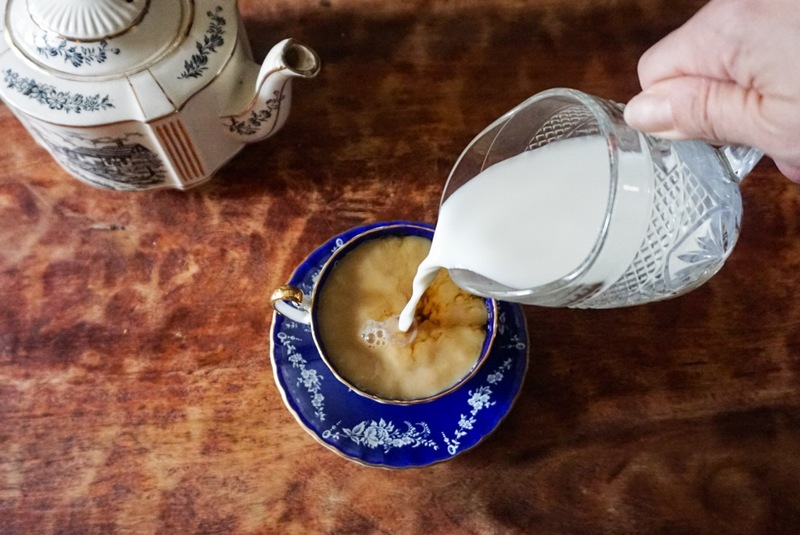 What other unique ways do you add milk to your tea? I can't even imagine a salty yak milk and butter tea! How unique! I personally have an Irish breakfast blend or straight Assam every morning with a splash of unsweetened almond milk. I love various teas without milk but there is something warming and comforting about a milky tea or milk tea latte! Thanks for all the info! It was good to know how the use of milk evolved in preparing tea and also the preparation of Tibetan butter tea sounds very unique & amazing. Keep posting such informative blogs.